Unique Loop Legato Mode : CHANGE VARIATIONS ON THE FLY WITH KEYSWITCHES, WITHOUT INTERRUPTING THE GROOVE. 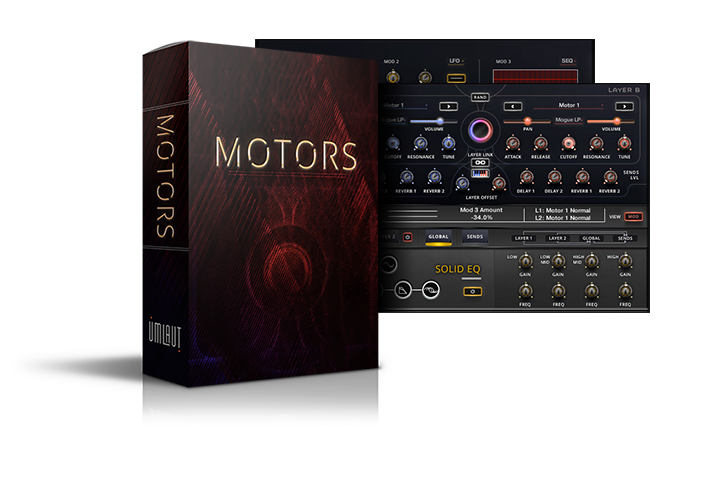 MOTORS is a virtual synth instrument for KONTAKT that lets you create and manipulate a variety of rhythmic motor sounds. It combines two layers of organic loops in interesting ways to form unique tonal rhythmic patterns for use in a variety of musical situations, spanning cinematic to experimental styles. 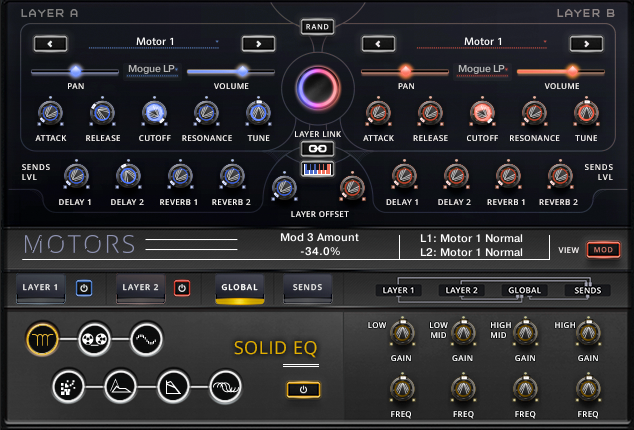 Featuring envelopes, modulators, step sequencers, creative FX, variations and randomization options, MOTORS allows for almost an endless variety of loops to be constructed using the diverse starting set of source loops. Built on top of the PADS Engine, Motors allows for manipulating loops in a similar way as PADS does for organic textures. 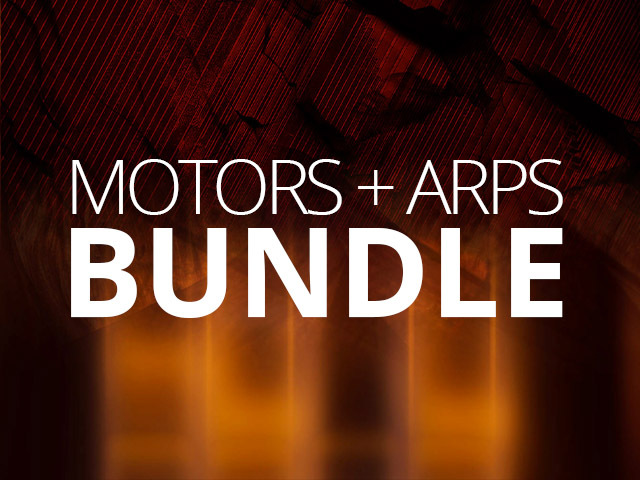 MOTORS comes packaged with 100+ presets that take full advantage of the entire set of features, allowing you to use them right out of the box. 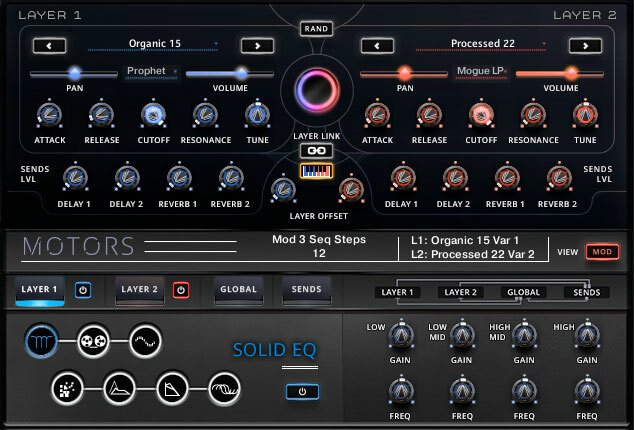 The Organic presets include clean and mellow loops that work best in musical situations where subtlety is key. Shift the patterns in time with the layer offset controls and you get limitless rhythmic variation with the same set of loops. The Complex presets comprise of grittier source loop timbres embedded with a host of modulations and effects, to use in situations requiring more powerful rhythmic patterns. The Experimental presets aim to showcase the weirder possibilities of the instrument. Utilising the modulation sources and effects to their extremes, these presets will add a touch of an unorthodox sound to your music. WE BUILT MOTORS KEEPING ONE GOAL IN MIND: RHYTHMIC VARIATION.  MOTORS has 3 Modulators, each of which can be an Envelope, LFO or Sequencer. Each of these Mod Sources can be assigned to a variety of Layer and Global Parameters for an extensive array of modulation possibilities. 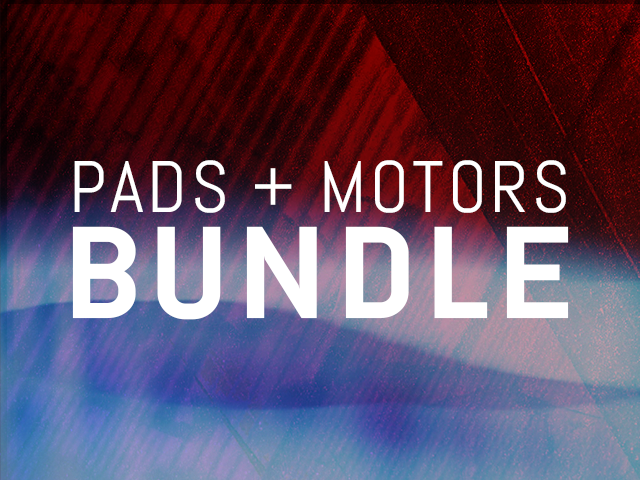 We’ve created an entire family of instruments with ARPS, PADS, uBEAT and MOTORS. Read more about our design philosophy here. 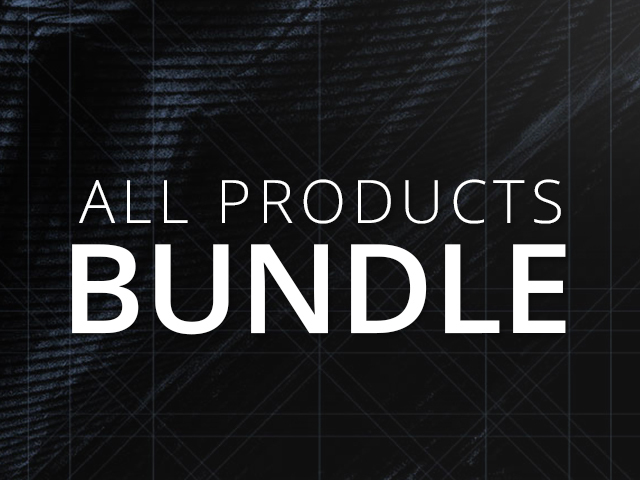 We've partnered with Native Instruments to allow our engines to be fully compatible with KONTAKT 5 PLAYER. This means that you do not need the full version of KONTAKT 5 to be able to use MOTORS. 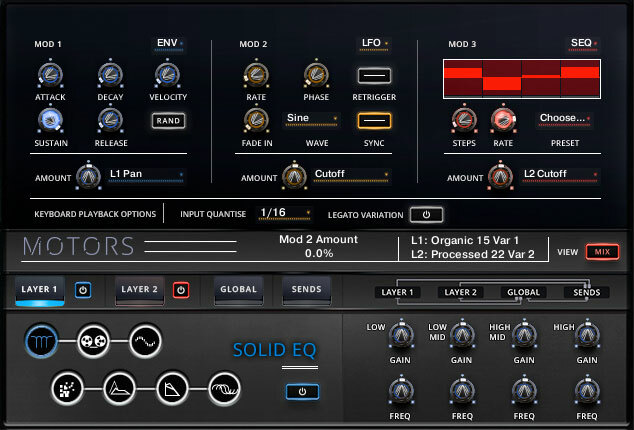 You can download Free Kontakt 5 Player here. THE INDUSTRY'S BEST COMPOSERS LOVE MOTORS. HERE'S WHY.
" Impressive ! MOTORS enables the creation of pulsating rhythms in record time. Pick a preset, tweak a few parameters, and begin layering them into your composition! " " It’s rare to find such a user friendly interface with as much control hidden in plain sight - I could get equally impressive results by pushing the random button as well as building patches from scratch ."